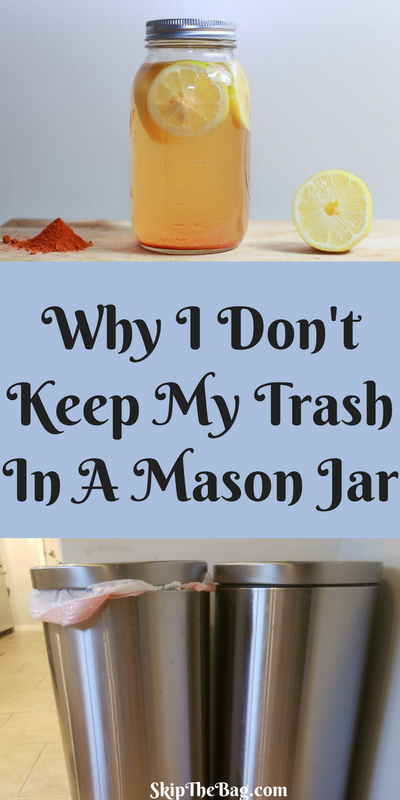 I can't remember the first time I heard about zero waste, but I bet you within a week after that I saw my first photo of someone who had saved a year's worth of trash in a mason jar. It seems to be a marker and prize for how far people have come on their zero waste journey. Well, you won't see that here. Why? Because we still have a full size trash can that we fill up regularly! It would take us less than a week to fill a Mason jar. purchase I may receive a commission, but the price to you remains the same. I lay no claims to being a zero waste or trash free expert. I am a regular person who started a blog hoping to inspire and be inspired. 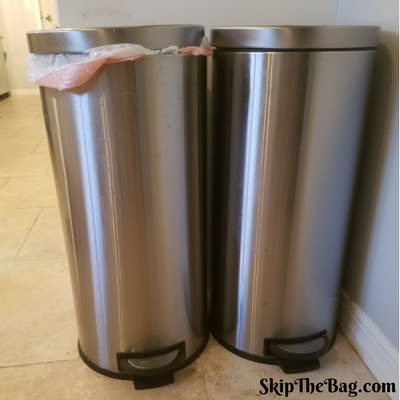 This blog has helped me examine and become more educated about choices I make.Through this education and inspiration I am working on making more sustainable choices that lead to less waste. I have already made some changes that will create less waste, but we still produce a fair amount of trash. Currently we have two trash cans that are slightly smaller than 13 gallons in our kitchen. One is for recycling and the other is for trash. We also have a compost bin for organic materials. Our recycle bin gets filled up every week and our trash bin would probably take 2 weeks to fill up, but it sometimes starts to stink so we take it out roughly once a week. Our outside trash can, the one that we take to the curb holds 4 or 5 of our kitchen trash bags so I would say we take it out to the curb 1-2 times a month. Pensacola has weekly trash and yard debris service. You either take their weekly service or have no service at all. I know some locations allow you to be more flexible with your garbage pickup. Portland, Oregon is set up where you have weekly composting pickup and monthly or bi-monthly garbage pick up. There are obviously places that we can improve further. We make a solid effort to make sure all organic material goes into the compost bin and that recyclable material goes into the recycle bin, but I'm sure there are some of those items still ending up in the trash. We also don't always shop with disposal in mind. We buy the packaged food and honestly that is probably where most of our trash comes from. 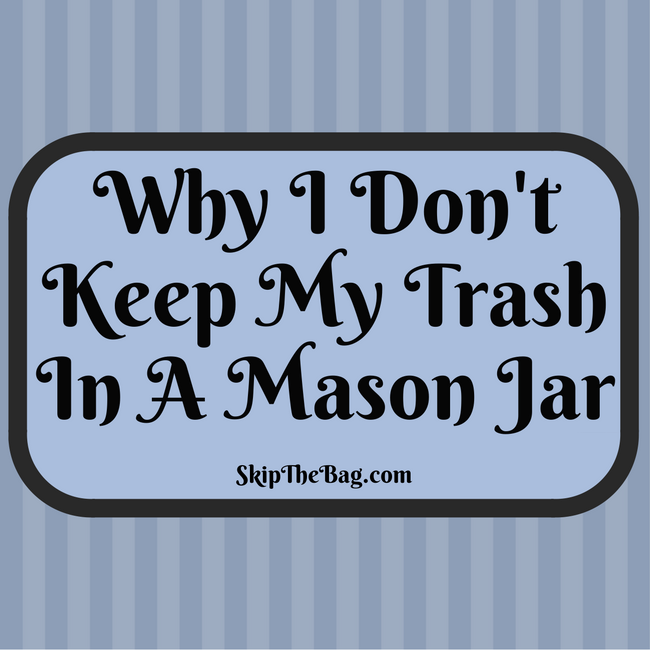 So while I'm not going to stun you with pictures of my trash in a mason jar, I am going to help push you (and me!) to make smarter decisions that result in less waste and lower impact on the environment. How much trash do you make? I'm with you. I am constantly looking for ways to reduce my garbage. Like you, my husband and I only create 1 to 1 1/2 bags a week for our inside trash. We could go 6 weeks without rolling the BIG trash bin out to the curb. The recycle bin also takes us 6 weeks to fully fill. I'm always suggesting to my husband that we should do this or that to reduce and recycle. Like suggesting hooking our washer into a gray water system to water the garden. He looked at me like I had grown another head and said, you already put a bucket in the shower to collect water for the plants, just keep doing the things you're doing. As long as we're doing something! Little changes can add up quickly in terms of reducing the amount of waste created. That's so great that you have a grey water system. I'm thinking we may eventually get a rain barrel (or something) for the garden, but that's still a little ways in the future. I am sure that all of us need to improve - I know I do, but I keep working on ways to save and improve waste. I really don't understand how someone could have zero waste all the time. I make sure I do everything to learn new ways and I know can see a big difference than the trash I had 5 years ago - I especially work to make sure I don't waste food or food scraps. Thanks for sharing your ideas and keep up the good work. Sharing! It's true, even the best zero waste people still probably generate some waste. But all of our baby steps add up. Thank you for sharing! Having a compost bucket on my counter goes a long way to helping reduce waste. I'm not perfect. We make about a bag and a half of trash a week. It would be less if my city's municipal recycling was less picky. We do end up filling our recycling dumpster every week. I know recycling isnt enough, especially in regards to plastic, but I am trying. Anytime you are filling up your garbage can less frequently than compost or recycling, you are doing a good thing! Same here. Definitely no mason jar, but have definitely noticed many changed habits. I still produce trash, but am more conscious about what I buy. 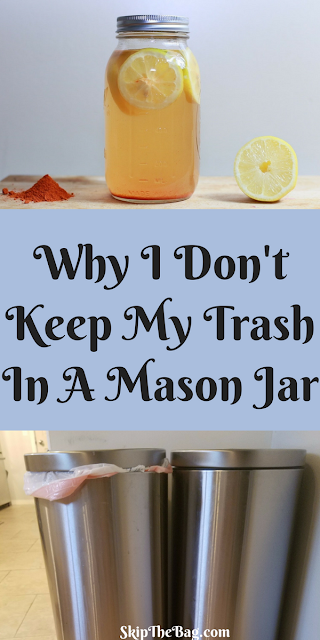 I worry sometimes that the "mason jar" is too idealistic a standard to start reducing waste. A lot of people may automatically think they can't do that, but as you mention, the goal is to start small and to start today.